Note that 'combat' missed the top-three spot on the budo list. Apparently martial arts strictly as a combative system (bujutsu) give morals relatively short shrift. 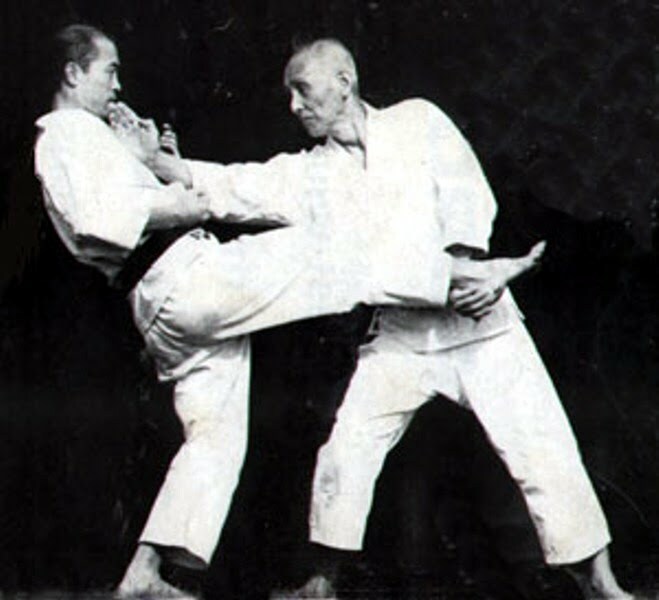 Being a moral person usually, but not necessarily, gives rise to other traits, such as politeness and humility as one karate blogger puts it. I agree these are desirable attributes to be found in the karateka. This brings up a pertinent question: Is karate training really capable of transforming an otherwise brutish lout into a 'nice guy'? Traditionally, the master of a dojo would interview a prospective student to see where he was coming from. Drunkards, layabouts and alpha-male tough guys need not apply. The whole idea of learning self defense is to ward off these jerks in the first place. I believe the "polite and unassuming" students one sees in the dojo likely started out that way before they ever stepped onto the mat. More than likely their training in a budo form accentuates already innate positive tendencies. I've personally seen how transformative the martial arts can be. Those lacking in confidence, physical coordination and even social grace can make amazing progress in these areas as a result of dedicated training over a period of time. But are traditional martial arts more about making good citizens or good fighters? I believe that budo - with its emphasis on morality and social responsibility - requires a combative core to make it all worthwhile. If a style or system gets too bogged down with philosophy or the "art" aspects to the detriment of realistic effectiveness, then it's simply not worth it. Equally, a style that lacks an understanding of right living is missing something very important. Great blog, as usual. My opinion, is that the two must be in balance with each other. The dojo is where the naturally athletic learn greater control and discipline, and where those lacking in confidence and coordination begin to hone and sharpen themselves. I think of the dojo as the ultimate crucible: The respective weaknesses of each karateka will be revealed. Some will quit. Others will push themselves into the furnace and let it strengthen and toughen them, whether that weakness be physical, social, or emotional. As ever, there is more going on than meets the eye. In my dojo, we don't really deal much with the social stuff very much, aside from the very occasional lecture from our Sensei, but it's tacitly understood that these skills are not to be used for anything but self-defense. Good to hear from you again, John! Great post that brings up a real chicken/egg problem. I had a couple of reactions to your post. First, when you talk about "those lacking in confidence, physical coordination and even social grace" as being desirable karate students, you're also describing people who are perfect targets for charlatans and scam artists. It can be very difficult for people who lack confidence to distinguish between a quality martial arts school and a sham. Martial arts has plenty of both. Regarding the rest, I still believe very strongly that the respect, humility and other positive traits are a side effect, not a goal, of applying oneself to mastery of ANYTHING. I'm suspicious of any group or school that emphasizes these secondary benefits over the pursuit itself. In other words, a martial arts school that de-emphasizes martial ability in favor of immeasurable abstracts such as "integrity" or "morality" are, in my opinion, less likely to ACTUALLY impart these traits in its student body. It would be like a youth football team that emphasizes morality over being able to punt, pass, kick, block and tackle. Positive traits are instilled in the kids through hard work applying themselves to the very task of learning these practical, measurable skills. "If a style or system gets too bogged down with philosophy or the "art" aspects to the detriment of realistic effectiveness, ... Equally, a style that lacks an understanding of right living is missing something very important." Yin-Yang or balance of motion since yin-yang never "stop" at any one point across the spectrum. Even Marines of warrior caliber in my limited experience were of both, combative expertise and moral alignment. No one I knew who visited Viet Nam ever wanted to kill or be killed yet realized their role of importance. That is not what I said. Go back and re-read my post. On the average, people that gravitate towards sports like boxing and wrestling have natural athletic abilities and aren't afraid to mix it up. Folks that take up TMA generally don't fall into that category. (I realize this is a very broad generalization I'm making here.) At first, they're not particularly good fighters, nor do they even like the idea of fighting. But they haven't completely lapsed into a lethargic state of indifference. So they come into the dojo to repair what they see as some shortcomings. As Frank alluded to, the ones that stick with it develop some resolve, and later, confidence. I'm sure you see some of this in BJJ. As for your other points Steve, remember that in classical Japanese budo it was moral perfection that was the ultimate goal for the aspirant. Actual fighting ability was considered a "side effect." A lofty goal, indeed. I think we agree on the impracticality of this, especially in our time and culture. Positive traits are instilled in the kids through hard work applying themselves to the very task of learning these practical, measurable skills. Hmm... depends on the kid, don't you think? Clearly that doesn't happen all the time. Some kids develop a 'winning is everything' mindset. Kids really need positive role models in all areas. Draeger was a carreer military man, and I think he infused a lot of military ethos in his writings. Actually I think his definition of 'martial art' (bujutsu) only referred to those that were documented as being used during feudal warfare. You bring up some good points. I do know what you mean by 'dojo consciousness', especially in a well established school. I've experienced some of that. Very insightful post, John. I agree about the requirement for a 'combative core'. After all, if someone claims to be pursuing some lofty philosophical goals THROUGH the practice of an art (whether a martial art or not), but does not strive to make that practice effective on a pragmatic level, then you would have to wonder why their efforts in the moral and philosophical dimensions would be any more effective.